communities and diverse cultures. Yet we've all heard about nightmare trips that promise green but deliver negative, sometimes damaging experiences. Moreover, for those of us who love animals, our fascination with them can cloud our common sense — and our responsibility to keep a reasonable distance from wildlife. The prospect of snorkelling with spawning salmon in British Columbia’s rivers, hand-feeding elk or swimming with belugas may trigger an eager “I’d love to do that!” response. But it’s precisely at these times that we have to summon our conscience and choose instead to keep wildlife healthy and protected in their habitats. 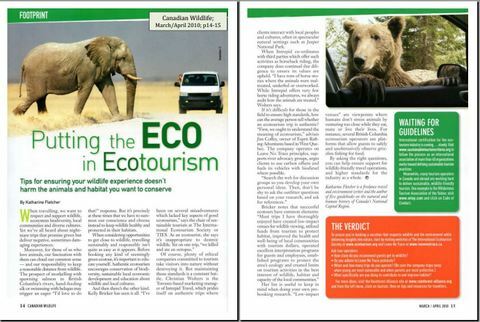 Published in the March/April 2010 edition of Canadian Wildlife Magazine. Visit Canadian Wildlife Magazine’s website.